With the dramatics of last week's federal budget battle largely over, D.C. will have to look to the silver screen to find more heroes and villains. 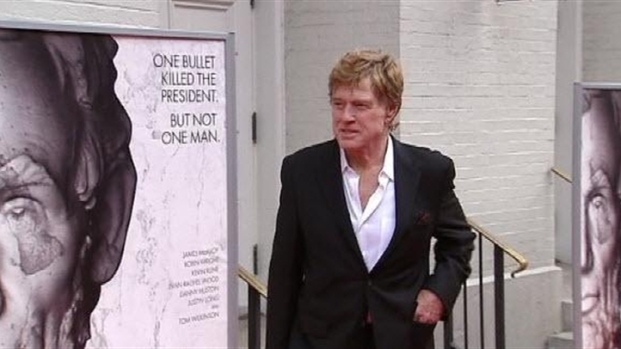 Enter Robert Redford with a new thriller set in the 19th century, which premiered at Ford's Theatre on Sunday. The movie "The Conspirator" delves into the story of President Abraham Lincoln's assassination, and the trial of those responsible. Robin Wright plays Mary Surratt, the sole female among John Wilkes Booth's alleged co-conspirators. Wright, along with Hollywood luminaries James McAvoy and Kevin Kline, walked the carpet into the movie's premiere Sunday. It was held in the same theater where Lincoln was mortally wounded. The stars were out at Ford's Theatre over the weekend. Director Robert Redford and the movie's stars made the walk down the red carpet past our cameras. The movie's executive producer, Webster Stone, was at the E Street Cinema in March to discuss the film. Stone called the film "not just an untold story... [but] an unknown story to most Americans." The film's stars also attended an afterparty at the Newseum later in the evening.